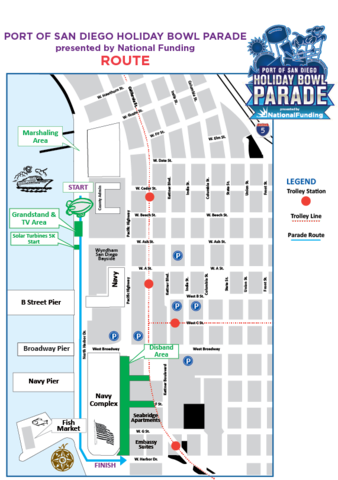 SAN DIEGO (KGTV) - The Port of San Diego Holiday Bowl Parade will bring giant balloons, floats, marching bands and drill teams down the Embarcadero ahead of Thursday’s football game. The parade will run from 10 a.m. to Noon on Harbor Dr. near the County Administration Building. You can watch the event in live streaming video on the 10News Facebook page or in person. More than 100,000 people are expected, which will bring extra traffic to the downtown area. The Port of San Diego says the best parade viewing is near the grandstand at the Maritime Museum because that is where bands will perform for the telecast.